Bushwick may not be for everybody, because of things like "unfounded prejudices against people who make more money selling stuff on Etsy than I do selling bonds" and "it's Bushwick." But this chunk of Brooklyn is peppered with some seriously welcoming and reasonably priced spots. 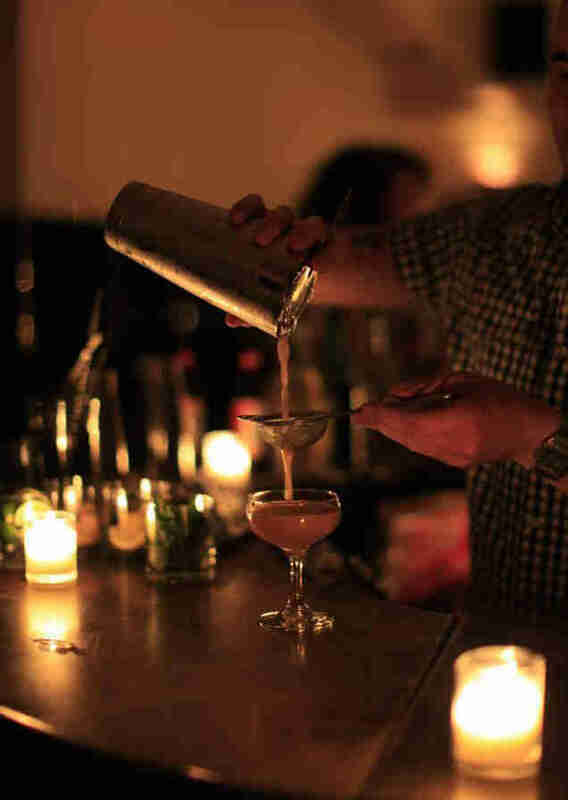 If your goal is to avoid the $14 dollar cocktail crowd, here are our favorite spots in Bushwick to day drink, night cap, or simply enjoy as a gentleman. With 20 wines (including two on tap), 12 drafts, and excellent cheap eats, it’s goddamn remarkable that this place manages to consistently hit that sweet spot between uncrowded and never-empty. 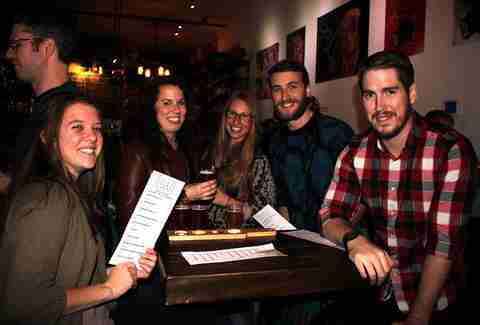 It’s the place to go with a handful of friends who you actually want to hear talk. Because nothing goes better with a $6 Genesee-and-a-shot special than yoga classes, Cobra Club offers both. You won’t feel like you’re in some New Age-y place though, because all the bar bases -- like a daily 4-9pm happy hour and occasional karaoke -- are covered. Also, sports are played on a big screen, which is rare for Bushwick. Cocktails at this Art Deco haunt star house-made infusions, but the $1 oysters everyday ‘til 7pm are of equal import. The amazing patty melt and fast food-style fries are highly recommended, too. But take note: It’s cash only. 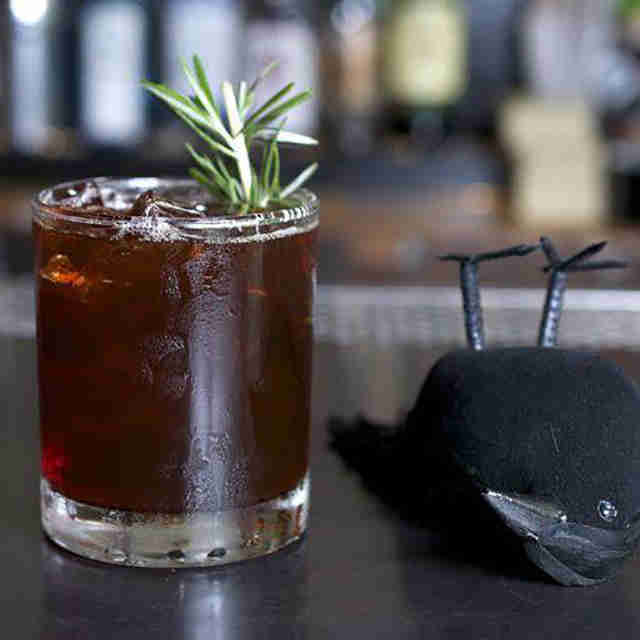 Coffee shop by day, whiskey bar by night, it’s got a simple seasonal cocktail menu, plus 14 draft crafts. The staff is kind, and whether you’re there for a night out or to work by day on The Next Decent American Novel, you'll be judged equally. As in, not at all. Technically, this laid-back Tiki-themed joint is a gay bar, but not blatantly so. There're frozen cocktails, indoor picnic tables, and a 4-9pm daily happy hour that takes a buck off all drinks. If you miss slappin' the bag, $3 Franzia is absolutely available. Leave your highfalutin attitude back at the loft, because you won’t find any snobbery here, despite the 20 rotating taps, massive bottle collection, and delicious local grub from Bedford Cheese Shop, Grandaisy Bakery, Sigmund’s Pretzels, and McClure's Pickles. You know that one friend from high school who never moved out of his mother’s basement, but you still enjoy a beer with him down there when you’re home for the holidays, because even though you guys wouldn’t be friends if you met now, you still have a lot of history? That’s basically how this tiny comic book-themed bar feels, and in a brilliant feat of economic manipulation, it only costs as much as one of the mini fridge beers he sometimes charges you for: $2 for PBR, $3 for PBR and a whiskey shot. Try not to get poked by a pool cue. 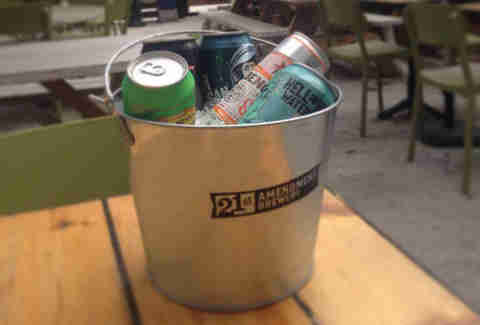 The spacious patio and summertime beer buckets are ideal, but if weather gets in the way, the super-extensive bottle and draft selection at the huge horseshoe bar will more than suffice. Side note: the lunchtime cheddar cheese patty melt is unreal. 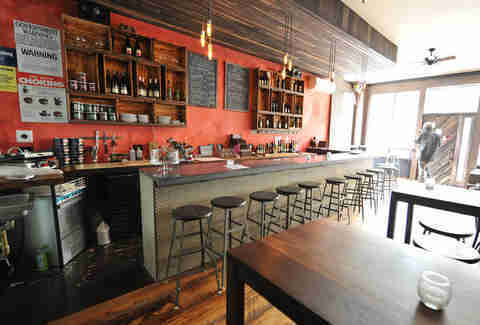 This cute neighborhood restaurant is known for its insane happy hour ($10 for a burger and a beer, and $1 oysters, Monday through Friday, 4-8pm) but after-hours on Friday and Saturday nights, it's also the best place to dance in Bushwick, with a sizable backroom and a DJ playing banger after banger. 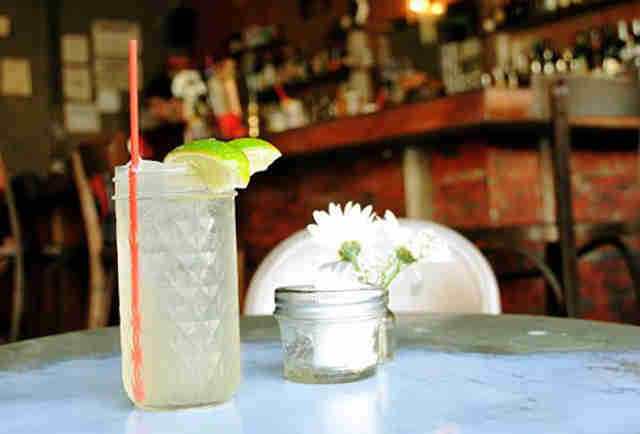 The doors and windows are all open in the summer when the weather’s nice, and cocktails are served in Mason Jars because 1) this is Brooklyn, after all and 2) Mason Jars are legitimately charming. 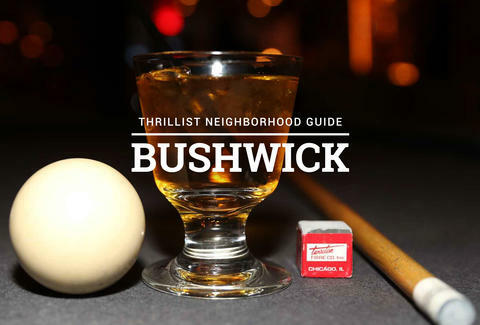 So although the OG Manhattan location is inarguably better, this swanky Brooklyn sister does have a $5 cocktail happy hour that runs until 9pm and billiards for a buck. Can’t beat that. Carrie Dennis is an Associate Editor for Thrillist and in a weird turn of events literally lives at Gotham City Lounge. Follow her on Twitter @CarrrieDennnis.